We do not own any factories, but we carefully choose our long-term partners and work closely with them to maintain and develop sustainable business. 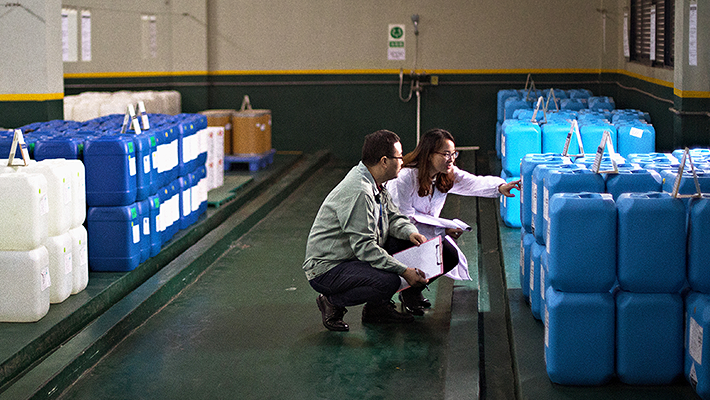 Jenny Zhang, Sustainability Manager NCAB Group China, checking chemical storage in the GCI factory, Zhuhai. 100% sustainability-audited and approved factories by 2018. Continuously improve sustainability performance throughout the supply chain. Implemented new plan for more frequent sustainability audits and sustainability work in China. Added more resources for sustainability work and audits in China. From Feb 2017, a full-time Sustainability Manager in China and since Jan 2018, one Sustainability Engineer. Read more about the key findings and achievements in our Sustainability Report. NCAB expects all of our factories to follow our Supplier Code of Conduct. For more information, download the NCAB Group Code of Conduct for Suppliers.